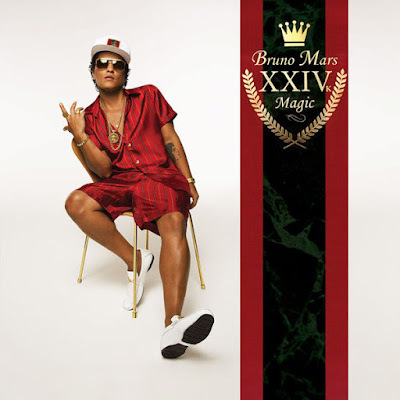 Bruno Mars is gearing up for the release of his highly anticipated album 24K Magic and he wants to give fans a sneak peek of what will be on the album. The singer released the track listing for the new album that is expected to drop on this coming Friday, November 18th. This album does not have any features, though it is rumored that Babyface contributed to the album.... which is pretty dope too! 24K Magic will boast 9 nine tracks, which seems like there is a variety of songs to groove to. So far, we have heard "24K Magic", which is a cool track that will definitely have you grooving. Bruno then released a slow jam, baby maker titled "Versace on the Floor" that will make you hit a mean slow grind, you know like them old school R. Kelly grinds LOL. "Chunky" was another song off of the album that the fans got to hear before the release. Mars actually debuted the song on "Saturday Night Live" and it was another upbeat funky type of track. I don't know about y'all but I can't wait to see what this album has in store. We already know what Bruno Mars is capable of doing, and with that 4 year hiatus, I'm sure he has been cooking up some great music. You already know that with a new album, comes a tour and yes he will be touring, staring in March. He will be hitting North America for the "24K Magic World Tour" in July and I'm sure he will be giving one hell of a show. He told Rolling Stone, "Anytime you see us, on tour, on TV, I want to be moving. Check out the tracklisting below for 24K Magic below. Will you be copping the album when it drops? What about the concert, are you going to be in attendance?